Have the guys at Digital Eel gone bonkers? First they offer Plasmaworm for free, now they're giving away both Big Box of Blox and Dr. Blob's Organism away - for nothing! 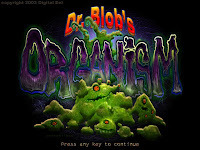 Dr. Blob's Organism was an IGF 2004 winner of both innovation in audio and visual art categories. Mac versions for these two games are also available. I was sort of expecting the games to open Digital Eel's web site when exiting, but nothing of that sort happened.